I've been meaning to write a blog post all about my art prints for a while and just not got round to it. I think sometimes people can worry about buying art prints - they can't see the colours, feel the paper and smell the ink through a computer screen (shame). So I've taken some super-clear photographs, just to try and help convey some of those things. Firstly all art prints are limited editions, so they really are super special. 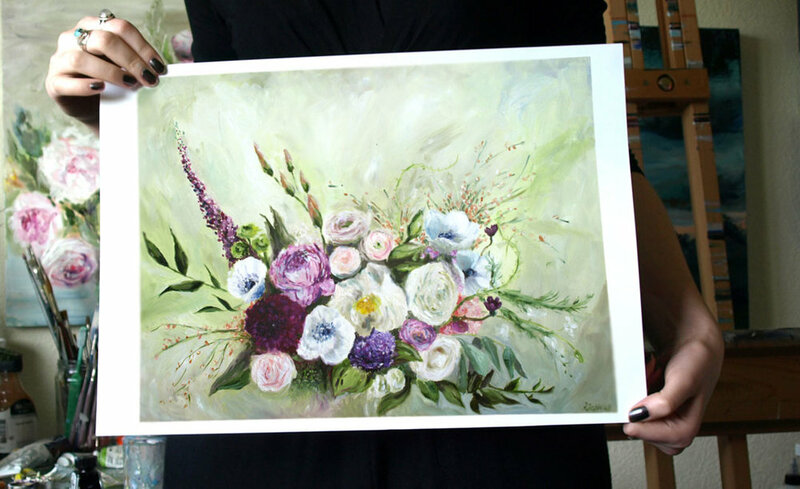 They printed onto the most luxuriant, beautiful, thick paper with 100% cotton rag matt base and even though its a print, you can see the brush strokes making it look exactly like the painting. It's so thick it feels like card! Each print comes with a 'Certificate of Authenticity' - What is that?! ...you may ask, but basically, it proves that is is 100% totally legit straight from me and the real deal. Then it is carefully wrapped in acid-free tissue paper, with it's certificate, and packaged well to protect it from the outside world as it makes it's way across the country...or world...to your doorstep. If it's a large print, then it will probably be sent in a tube, which are so stable and protect those lovely sharp edges!